Now featuring 51 Stores, Maps and Store listings. 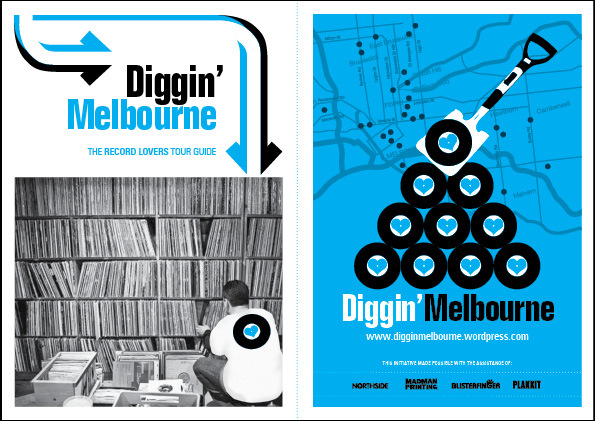 Thanks for checking out Diggin’ Melbourne. The Diggin’ Melbourne Record Lovers Tour Guide features maps and detailed listings of specialist Vinyl Stockists in and around Melbourne. Whilst we’ve endeavoured to include every ‘Diggin’ Spot’, it’s impossible to list them all, and some remain secret! The new 2011 Diggin’ Melbourne Map is bigger and better than our previous edition, and now features more than 50 listings of Melbourne’s infamous vinyl haunts and music emporiums. The Map is available FREE around Melbourne and can be found at record stores, cafes, cinemas, tourism offices and various other clandestine locations! This website also features the the stores listings, downloadable PDF versions of the map and a few other treats for vinyl enthusiasts of Melbourne and around the world. Over the next 12 months we will be attempting to add some of the more notable new vinyl releases coming out of Melbourne (and Australia). Melbourne is renowned worldwide for its vibrant music and arts culture; we have a thriving funk + soul scene and Melbourne’s rock + dance culture speaks for itself. That means lots of records – funk 45s, punk 45s, disco joints, soul albums, jazz, experimental and more. Check the music page over upcoming months to see whats up. If you are releasing records – please contact us. Everyone knows that vinyl is still king. It sounds better, feels good and looks great. What’s more – lots of the music we love is still only available in this format, forever sounding the way musicians and producers intended it to sound when recording and manufacturing these amazing pieces of art! Vinyl – The classic collectable for music lovers. Please note: Error in the print/hard copy version of the map. Locality Maps have been transposed on stores 46 and 47. For Dixons Recycled (Blackburn) map, please refer to Map 47 Essendon Seconhand and vica versa. The listed addresses are correct. Apologies to both stores. This is incredible, literally every crate diggers and vinyl collectors dream come true. Much respect and appreciation for putting in the time and effort to make something like this possible. Wish every city had people this dedicated to the vinyl cause! Many thanks to all that have put this together and it has led me to find some amazing vinyl that I will share with the world via my radio show in Bangkok. Love & Peace and may the music never cease. Props guys. Thought I would try and give this Diggin’ Guide as much exposure as it rightfully deserves. I blogged it on my site. Check it out if you’ve got a minute.